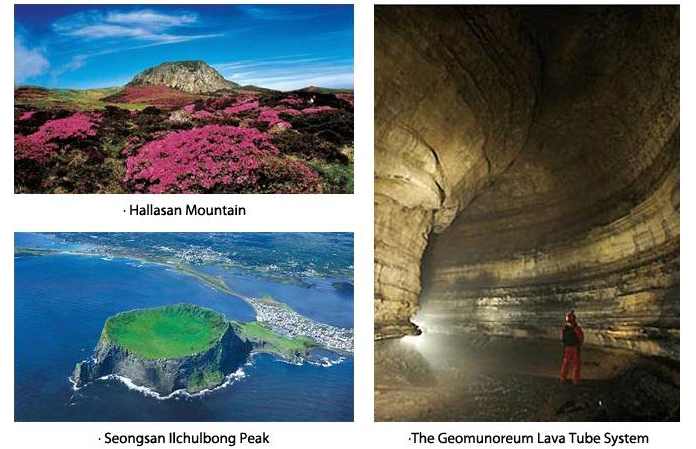 Located southwest of the Korean Peninsula, Jeju Island is a volcanic island was formed by five millions of years ago. The weather on Jeju Island remains significantly warmer than the mainland even during the cold winter months. Jeju island is sometimes referred to as “Samdado Island”(meaning the “three many”) because of its abundance of rocks, women, and wind. Wind from the ocean blows steadily throughout the year and past volcanic activity has littered the island with an assortment of beautiful and unusually-shaped black rocks. The island’s reputation of having an abundance of women points back to the time when fishing was the primary means of income and many men were lost at sea. This tuff cone is the result of the island’s volcanic history. Seongsan Ilchulbong Peak is famous not only as a geological wonder, but is also one of the best places in Korea to watch the sunrise, earning it the name "Sunrise Peak." IS the largest lava tube system on Jeju .The lava tube system has only recently been opened to the public, meaning that the tubes have remained well-preserved and can still be seen in their original condition.